I bought a Fengtian dollar a few months ago, for the hefty sum of 40,000CNY – about $6000 USD. It was a very crisp looking, almost uncirculated, but unfortunately badly cleaned dollar. The edge was very convincing too, with a little bit of what looked like verdigris in some reeds. I was just somewhat intrigued by hints of a black substance around the legends and the rim. It didn’t look like carbon spots, more like some kind of ink. I wasn’t too worried though: quite often, people dipping coins are disappointed when they find out it doesn’t tone anymore, so they try to artificially colour the coin. Using chinese ink is not so uncommon for that purpose. 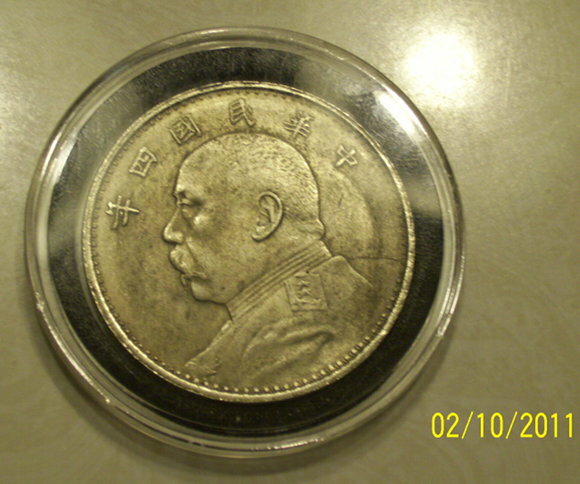 Even with these issues, Fengtian coins with full details are very hard to come by, so I bought it. As time went by, I found out a few minute difference between my coins and some similar ones sold in auction houses. The cloud below the rightmost claw of the dragon was not exactly the same shape than on the pictures. The left 口 of 器 was calligraphied slightly differently as well: on other coins, the right stroke is sticking out a bit at the bottom. One Manchu character on the reverse lacked a serif. Since these differences were very subtle, I thought it was maybe just another die variation. 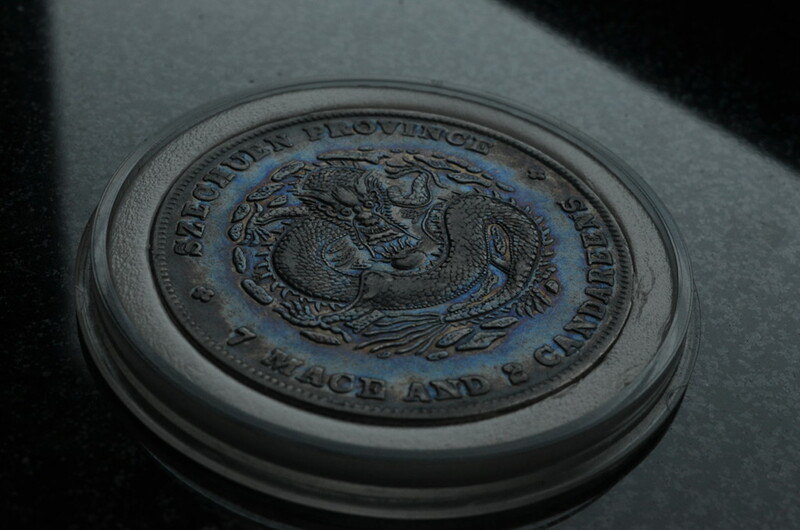 I searched for more pictures of genuine coins of that type, but I eventually was unable to find one looking exactly like mine: all of them shared the same features. At that point it seemed less and less likely that my coin was genuine. I went back to the market where I had bought it, with the idea to get it assayed by expert coin dealers there, and to get my money back if they confirmed it was a forgery. Two of them examined it carefully and said they were not sure if it was genuine or fake, but that it looked convincing enough. The third one said it was probably genuine, but warned me he was not a specialist of the coins from this province. I was not satisfied by these answers. I was about to leave, when I decided to try asking a last coin dealer. She was a nice elderly lady, and when I asked her if she thought the coin was genuine, she didn’t reach for her magnifying glass like everyone else. Instead, she simply took one of her coin, a British trade dollar, and hit my dollar with it. Then she hit the trade dollar with my coin. It didn’t sounded the same… That was definitely a bad sign, and I felt a bit ashamed to not have used this old trick myself before. She then fetched a tiny portable weighing machine. The coin weighed 25.9 grams. One gram underweight. The verdict was clear: the coin was fake, as the kind old lady was now telling me. She also quickly checked if it was magnetic, but there was no real need at that point. While all of us, proud of our knowledge of chinese numismatics, were pondering if the coin was real or not by looking at the minute details of its surface, she found out the truth in the most elegant way. She just went back to the basics and worked it out from here.